Cast: Lindsay Pulsipher ("True Blood," "Hatfields & McCoys"), Andrew Walker (Date With Love, Steel Toes), Kim Delaney ("Army Wives," "NYPD Blue"), Robin Givens ("Riverdale"), Gary Grubbs, LaDainian "LT" Tomlinson (NFL Pro Football Hall of Fame, NFL Network analyst), Jordin Sparks (Sparkle, Left Behind), Makenzie Moss (Steve Jobs). Amber Hill is a vibrant songbird, a follower of Christ, a faithful churchgoer, choir leader, involved mother, and a devoted Army wife — until she receives the visit every military family dreads. Her husband Darren is a respected lieutenant in Afghanistan, the surrogate father for his unit, and a man of integrity who shares the Gospel with his squad-mates. When Darren is killed in action, Amber is left distraught, her faith shaken and on her own, raising their precocious daughter Bree. Two years after his death, Amber is working overtime as a waitress to make ends meet, juggling motherhood, debt, work, and a mother-in- law who offers to help, but only adds more stress. Amber is seemingly helpless, exhausted, and perhaps worst of all, distant from God. Unable to understand why life has gotten so difficult, Amber stops singing and retreats inward, crushed beneath pain and confusion. She tries everything she can to work things out on her own, bottling everything up inside. Her friends from church are there as a constant source of support, but no matter what anyone says, it seems Amber just can’t grasp what God is doing in her life. God Bless The Broken Road is exactly the sort of well-made, tear- jerking, patriotic, heart-swelling drama we need right now. 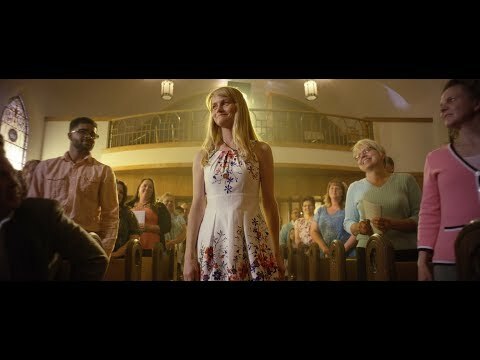 Using parts of the well-known Rascal Flatts’ song (albeit tweaking the lyrics a bit) to flesh out a story, this film explores the age-old question, "What in the world is God doing when my life is falling apart?" Viewers watch as Amber scrapes and struggles; we watch as her child suffers emotional turmoil and unresolved grief; we watch a mother who has lost her child; a stubborn, semi-washed-up race car driver; a supportive church family, and a struggling veteran. All of these individuals, their seemingly broken lives, make up this road the film speaks about. Cody, the bullheaded race car driver, arrives in town to perfect his turns. It seems he only wants to go fast and sets himself up for a crash every time. Joe, his coach, explains that the answer is not to go faster, but slower. In comparison, Amber is pounding right along, trying to hold it all together. What I gather from this film is that sometimes in life, while we travel a broken, unpredictable road (wondering what God is up to), the answer is not to speed up, but slow down — slow down and engage God in our suffering. Slow down and sing His praises. Slow down and take notice of the needs of others. Perhaps when we acknowledge and accept that the broken road is a part of God’s master plan, we can begin to move forward. And oh, how it will all be worth it when we look back and see how those broken pieces fit together. God Bless The Broken Road has been awarded the Dove- Approved All Ages Seal.